8 Simple Ways You Can Help Honey Bees – Southwest Honey Co.
As the honey bees continue to struggle we find that they are most effected by the diminishing amount of natural land space, pesticide use, and a lack of public and community knowledge about pollinators. So often we are asked by community members, “How can I help the bees?” To many people’s surprise, there are MANY ways that people can help honey bees without having to do anything drastic! These suggestions of how to help are often simple. The fun part is- many of these ideas are ones that a family can do together! Due to many factors (monoculture-based farming, green lawns in suburban neighborhoods, and destruction of native landscapes) the honey bees are losing habitat quickly. Planting flowers that are CHEMICALLY UNTREATED in your garden or yard will help provide the bees with a place to forage. Chemicals can seep into pollen and negatively affect the bees. Check with your local greenhouses to see if they carry plants that have NOT been pre-treated with a chemical known as neonicotinoid. Plant many of the same type of blooming plant together in clusters. Bees enjoy volume when they forage. Check with a LOCAL greenhouse to be sure their plants are not pre-treated with chemicals. Typically, large box stores only carry chemically treated plants. Plant flowers, herbs & trees that are native to your area. Native plants can look just as great in a flower bed as non-native plants, but they typically bloom longer, retain more water in their root system and are better for the environment. For more information on Indiana Native Plants, see more information on the INPAWS website here. 2. Weeds Aren’t Always So Bad! Contrary to what most believe, leaving clover and dandelions in your yard is a GREAT thing! 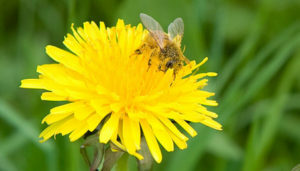 Dandelions are one of the first spring blooming plants that give honey bees access to pollen and nectar early in the year. Don’t be afraid to let your lawn live a little! Honey bees also LOVE clover and would be ever so thankful if it was able to grow until it bloomed. Support your local beekeepers! Not only does buying local, raw honey have many health benefits and medicinal purposes, it also helps support your local economy and farmers. Become A Beekeeper: Beekeeping takes hundreds of hours of preparation, learning, and research. We do not advocate for people becoming beekeepers without the proper knowledge, resources, or support. We encourage those interested in beekeeping to seek a program to help them prepare, perhaps take a course, or find a mentor. Host A Hive: Although some are not able to keep bees on their own, often, they may have land or property that is suitable and sustainable for honey bees. If you are interested in hosting a hive, please contact Southwest Honey Co. at (260) 609-2897. We have on ongoing list of perspective apiary locations. Donate By Naming A Bee! : You can help support Southwest Honey Co.’s efforts by clicking here to make a $5 donation. With every $5 donation, you get the chance to name your very own bee! From “Bobee” to “Bee-m Me Up Scotty,” we’ve had a lot of fun seeing what creative names people have come up with to name their bee for this fun and worthy cause. All funds go towards our mission of promoting, preserving and finding homes for the local honey bee population. What’s true with purchasing local honey also holds true for our other food sources. Buying local may mean eating seasonally but also means that you know where your food is coming from. Local farmer’s markets are a great place to seek out farmers, have a discussion with them and find a grower that you enjoy purchasing from. When you buy organically from local farmers, the produce is in-season and hasn’t been treated with harmful chemicals. This greatly helps pollinators in your area. 5. Bees Get Thirsty Too! People often forget that bees have to hydrate too! In our growing urbanized communities, there is often a lack of standing water that you would otherwise find in forests or natural land space. Because of this, honey bees find it difficult to find fresh water sources to use. Once you’ve planted many native flowers and your garden is beginning to attract more honey bees, place a water basin out for them (a bird bath, with some rocks in it for them to crawl on works perfectly- if there’s nothing for them to land on, they may drown). 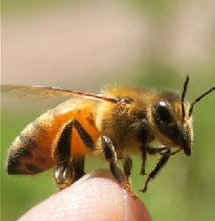 Honey bees are NOT out to sting you. Honey bees are an integral part of our ecosystem and they are more concerned with their pollen and nectar collection than they are with us humans. Honey bees are vegetarians and will travel up to 3 miles from their hive to forage for pollen and nectar. This pollen and nectar is then brought back to their hive and provides food and sustenance for the bees. Not all flying yellow insects are honey bees. Know the difference between helpful insects such as bumble bees and honey bees, verses pest-type insects such as wasps and hornets. Try to stay still and calm if a bee is around you or lands on you. It will soon fly off. Swatting or brushing it off may hurt or intimidate it into stinging. Don’t ever stand in front of a hive opening, should you find yourself near a beehive. Bees are busy flying back and forth from the fields to their home- this is their “highway.” Try to stay out of their way and they will certainly stay out of yours. Support legislation designed to protect pollinators and create more naturally preserved land space. Actively petition for change, conservation and preservation of natural land and animals. Be proactive and contact your local, state and national officials with concerns or proposals. We would be ever so thankful if you would pass along Southwest Honey Co’s contact information to anyone in the community whom you feel it may help. We are happy to connect with various groups and work on outreach to take our educational programs on the road or plan field trips to one of our educational sessions. There are many organizations that support natural preservation and pollinators. Please consider donating, volunteering, supporting, and following on social media. Pesticides. If you must use a pest control, remember that sometimes even organic pesticides can have a negative impact on honey bees. When considering pesticides, please remember we share the outdoors with all living creatures. The beauty of the outdoors we enjoy is because of all the insects, their pollination and contribution to the ecosystem. Killing them for human comfort is selfish with all things considered. Apply pest control in the evenings (or at night) when most bees are back in their hives. 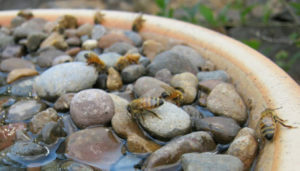 Avoid getting pest control substances in standing water, as the bees will most likely use this water for hydration and bring it back to the hive with them. A swarm is a grouping of thousands of bees, generally clinging to a tree branch, trunk or man-made structure. They are looking for a new home after their colony has gotten too large for their previous home. Unfortunately due to urban development, honey bee colonies become a nuisance in a suburban area when they are all outside of their home and gather in someone’s mailbox or backyard tree when making this move to a new home.